Capcom’s prequel to the events of ‘Resident Evil’ satisfies many of my survival horror cravings, but it is not without its flaws. One of the first games I ever remember reading about was Capcom’s Resident Evil remake for the GameCube in 2002. At the time I had just recently started my first subscription to Game Informer and was beginning to be amazed by the fact that the video game journalism industry even existed. I remember being blown away by some of the still shots of Resident Evil, especially those of the zombies, hunters and incredibly eerie mansion hallways. I only had a short period of time to play the game before my parents deemed the game “too violent” for “decapitations.” I wasn’t allowed to play after that, but what I did play grabbed me. From that point on, Resident Evil held a special place in my heart. It was a franchise I always knew I wanted to return to and one day conquer. So when I heard that Capcom was re-releasing 2002’s GameCube Resident Evil and Resident Evil 0 for current-gen platforms, I couldn’t wait to get hands on and experience the survival horror for real this time. There’s Something Off About This Train…. Resident Evil 0 begins on the outskirts of Raccoon City near the Arklay Mountains, the same environments featured in later Resident Evil titles. Players assume control of Rebecca Chambers, a rookie field medic for S.T.A.R.S. Bravo Team sent to find and detain a convict by the name of Billy Coen. Their journey together takes them through new and familiar locales for Resident Evil fans, including the Ecliptic Express, an Umbrella training facility and of course an underground laboratory. For the most part the narrative is sound. At times Billy and Rebecca’s dialogue can make you feel like you’re in a cheesy 80’s slasher flick, but that’s nothing new for the Resident Evil franchise. I personally found the cheesier dialogue helped to create a sense of comic relief in an otherwise scary game. However, while Rebecca and Billy are fully realized as characters, the supporting cast of Resident Evil 0 is pretty disappointing and bland. Spencer and Birkin, both antagonists in later games, do make appearances here, but they feel forced and altogether unnecessary. Without spoiling too much, the main antagonist of the game in particular feels horribly designed and poorly explained. This is unfortunate because the events of the game do such a fantastic job at slowly building up tension in the environments to just have it disappear in the game’s finale. Truth be told, the only thing that kept me invested in Resident Evil 0 from a narrative perspective was the fact that it ties in directly with the events of Resident Evil. Resident Evil 0 does succeed in providing more backstory and motivations for the events leading up to the Spencer Mansion, but when it tries to do more than that, you quickly realize that narrative is not this game’s strong suit. From a gameplay perspective, Resident Evil 0 is pretty fluid. 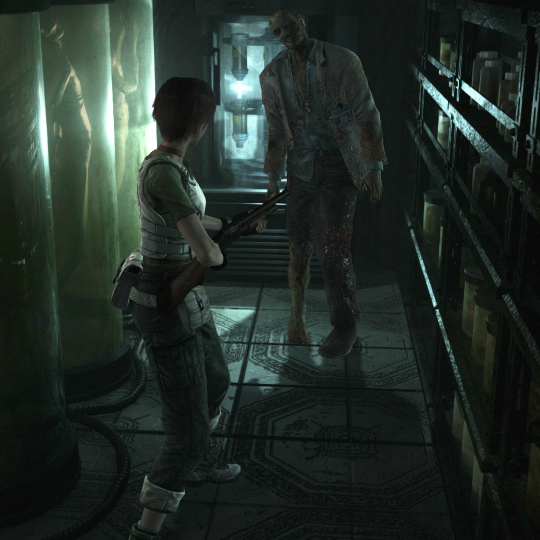 Players can at almost any point swap between playing as Rebecca or Billy as they navigate creepy environments through pre-fixed camera angles. While the older versions of the game forced players into learning a tank control scheme that made movement damn near impossible at first, the HD version allows players to use an alternate control scheme. For a game that features some incredibly small corridors and tight maneuvering, this was a godsend. Being able to precisely move around certain enemies and rooms meant the difference between living to fight another day or wasting all your precious ammo just to survive. This is a huge deal, especially considering that one of the primary mechanics in the game is item and ammo conservation. It’s tempting for most first time players of Resident Evil to want to kill every enemy they see, but trust me, that’s not the way to go. On my first playthrough of 0, I got all the way to the last boss and preceded to die some 20 times before realizing I literally didn’t have enough ammo left to complete the game. The fact that that’s even possible is going to be a large turn off for some people, but for those who learn the intricacies of the game’s item management, the reward is well worth the frustration. In addition to ammo management, players will be constantly asked to juggle weapons and key items in their inventories. Resident Evil 1 introduced item boxes in which you could store inventory and pick up the same items at another box. Here, they got rid those. I’m assuming the logic behind it is that having two characters effectively doubles your inventory space, thus making for less item juggling. In reality, limited inventory space for Resident Evil 0 means the player is constantly making the tough decision of dropping one weapon for another, or deciding to forgo a health herb so that you can grab an item to progress the story faster. Given that larger items like the shotgun and grenade launcher take up two of your six allowed inventory spots, item management can be incredibly difficult. If Resident Evil was easy, it wouldn’t be nearly as fun or rewarding when you finally triumph. Since this game is an HD remastering, it goes without saying that graphically the game has been updated and looks fantastic for the most part. In game character models and environments look better than ever before and do a good job of immersing you in the game world. Table cloths sway in train cars as you walk by them and beautiful paintings litter the walls of the myriad of rooms in the Umbrella properties. Both the lighting and sound effects constantly add to the terror and tension of the game. You can hear zombies shuffling and breathing heavily as they make their way towards you from an angle that you are not privy to see. In fact, nearly every moment of playing Resident Evil 0 looks and sounds fantastic—that is until cutscenes are triggered. The graphics weren’t updated at all. I understand that redoing entire cutscenes in a game is an arduous task, but when pre-rendered cutscenes look worse than gameplay does, something just isn’t right. As far as the art direction is concerned, though, it’s hard to beat Resident Evil 0 for survival horror. Enemies come in varying types, sizes and lethality, with some of my favorites being ravenous baboons and a giant carnivorous bat. Environments are colored beautifully as well and manage to have a Gothic and Victorian aesthetic to them. Each location within the game felt unique and distinct, which is a hard feat for a game series that tends to feature similar geography in each entry. What’s even better is that in all my encounters with these enemies and environments, the game never had any issues with framerate, crashes or soft locks of any kind. Resident Evil 0 is probably one of the hardest games I have ever played. To a Resident Evil veteran I’m sure that sounds pretty ridiculous, but for the casual gamer or newcomer to the franchise, learning how to play an old school survival horror game is flipping hard. There were times within my 15-hour playthrough where my patience ran pretty thin. After the third or fourth attempt at the same 20-minute segment, you start to get frustrated. Yet, each of these frustrations stemmed from me as the player not properly understanding the mechanics of the game or really how to be good at it. Once I figured out that running was just as viable an option as fighting was, Resident Evil 0 opened up and became one of the best tactical survival horror games I’ve ever played. What’s your favorite ‘Resident Evil’ game? Are you excited that Capcom is revisiting these older classics? Tweet me @FlagCap. And be sure to follow us @YouNerded. *This review of Resident Evil 0 HD Remaster is based on playing a digital copy of the game on the PlayStation 4 console.